You are here: Home Forum Home Stern Drives 292 GM straight 6 Gen 1 Alfa conversion. 292 GM straight 6 Gen 1 Alfa conversion. TOPIC:	292 GM straight 6 Gen 1 Alfa conversion. I have a complete Merc/ GM 292, 200hp engine, everything including 1/2 the stringers from the hull it was cut out of. Last week I came across a 87 Gen 1 Alfa 1 again including the transom it was cut from so all the parts are there everything but the steering cable trim pump and lines power steering pump and lines everything. I have always been reluctant to use this engine mainly because of the orig drive really wasn't the greatest unit Merc ever put out and didn't last on the market anyway. So the Alfa 1 I got is really nice and doesn't appear to have been beat up or long hrs on it, nothing is rotten or frozen up/bellows/cables/anodes/swivel pins, everything is about perfect. I haven't been able to get to mating these up yet so I was wondering if anyone has done this and if I am going to have to have a different coupler or any other odd parts? Also, anyone every heard of a split marine exhaust manifold for one of these? Old cars guys know the sound of a split 6 and it is great and what I have planned for this it might be a must. A little peak at the plan, sorta. As you know, they only offered the engine package for 2 or maybe 3 years in the late '60s. 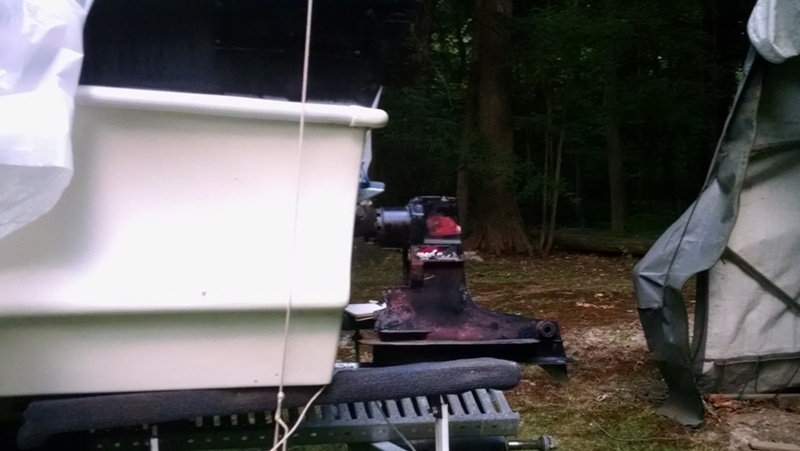 It was mated to a MerCruiser 2 outdrive as the #1 drive was not strong enough to handle the torque. At this time, the #1 drive maxed out at 160 HP 250 CID. Evolution eventually strengthened the #1 drives and they were offered with up to 260 HP 350 (5.7L) in the early '80s. I don't know the torque of the 292 vs the 350, I'd bet they were similar. The Alpha Gen 1 (1983 thru 1990) was offered with up to a 330 HP 454 (7.4L). Both the 260 HP #1 drives of the late '70s and early '80s and the 330 HP Alpha Gen 1 were subject to somewhat frequent failures depending on how they were operated & the size of the boats they pushed. I believe you will need to verify the spacing of the rear engine mounts on the inner transom plate to the 292 bell housing (same as any 110/120/140/150/160/165 inline). I have a feeling you will be limited to mid '80s or earlier transom assembly. The Alpha Gen 1 will bolt directly onto any #1 bell housing from 1967 or newer. The 292 used a 4 barrel carb & manifold. The same manifold was used from 1970 and later on the 165 HP 250 inline 6 with a restrictor plate & 2 barrel carb, so exhaust hook-up should be no problem. I don't know what gear ratio I would look for, but I'm thinking 1.5 or 1.32 depending on boat size. The old number 2 drive was a beautiful beast, and it could handle anything the 292 could offer with the greatest of ease. They were vastly overbuilt and virtually bulletproof with just about any engine coupled to it up to 300 horse. Built from 1963 to 1969 they were the platform for the early SSM racing drives built by Mercruiser, but like Rodney Dangerfield, they don't get any respect. I rebuilt several of them for customers before the parts supply dried up, but I never once saw one fail from shaft, gear or bearing failure. Usually it was the clutch plate or electric shift that gave issues, not the drive itself. If they still made parts there would be a lot of them still in service to this day, one of Mercs best. The real reason it went away is cost, not that it was a poor drive. The Alpha is a good drive provided you don't overpower it or use it on too heavy a boat. The 260 was about the max that it could handle and using the big block really increased the traffic in my service shop, way too much engine for that application. On heavy boats they would benefit from a gear ratio change to take some of the load off the gears. Torque is what kills gears, and you really need to watch the propping to keep the revs up and the lugging down. Synthetic High Perf lube is a must and a drive cooling shower kit is a definite plus. The 292 should be a nice match for that drive if properly set up and propped, but I am not sure if the bell housing would have to be modified or not as the 292 had a different mounting system than the 250 six used with the one drive. Might need to check that first. Yes the 292 had the #2 bell housing but the standard #1 inline bell housing will bolt on. But in order for the straight manifold with the straight back exhaust riser to line up I believe he will need to use transom plate that was used into the mid '80s. That would be early Alpha Gen 1. There was an evolution of gimbal ring to steering tiller styles used. I think the square/square was the best but any with the trim lines coming out the bottom would be OK. Side mounted trim senders & greaseable gimbal bearing would be my choice. I have heard but never verified it that the spacing of the rear motor mount bolts was changed later. Depending on the boat, it should not be too difficult to do the conversion if the bell housings are similar. The 292 is taller than the 250 but it still should fit OK. A custom exhaust riser and outlet would be needed of course or you could shoot through the transom. Split manifold anyone? They sure sound neat in the vintage trucks!! !